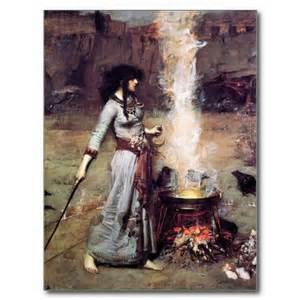 The preceding is a witches’ chant from the Wiccan Rede that speaks of the need to speak a spell in rhyme. I try to do this when I create a spell mainly because I enjoy writing in this fashion. Many people will argue (and I agree) that it is the intent of the magician that is most important, and rhyming words will not make or break a spell. A rhyme can help in remembering the words in certain chants and rituals and this can allow the spell caster to speak the words with more of a flow. Today, however, I felt Spirit telling me of another reason to create my spells with rhyming words; and that is to build power. I chose to work my spell in the morning and my crow and raven friends were out in the yard in full force. As I began smudging the area for the circle one large black bird came very close to me and very noisily commented on what I was doing. Ted Andrews in his book, Animal Speak, speaks of the crow and raven as representing (among other things) the power of the word. Even if a person is speaking to Spirit in silence they are still using words to form their thoughts. Sound itself is energy, so it stands to reason that that the spoken word should carry some power. We have all experienced the power of a word spoken to hurt as well as words spoken to comfort and heal. Such power there! The crow and raven also represent magick. No wonder my feathered friend was getting so excited! I believe that casting a circle is not only to protect the witch from evil or negativity. Actually, I ask Spirit to do that before I even begin any casting. What I like to think the circle is also doing is containing the energy of the spell and allowing it to grow until I am finished and ready to release it into the universe to manifest in the physical realm. I used to cast a circle just for protection, but now I feel its purpose is also to contain. To grow the power of all I do. And as above now, so below! An important part of spell casting is raising the energy. This can be done through drumming, dancing, playing an instrument and, you guessed it, singing or chanting. By repeating those rhyming words over and over in multiples of three the energy builds. Say those words with rhythm and feeling and the power really grows! Don’t dismiss raising the power as unimportant. Spells have a lot more punch when the power is raised, and how better than through the power of the word? Even nonsense words can build power. “Heckedy, Peckedy” , “Bubble, Bubble,” (sorry!) have a rhythm to them that is mesmerizing. Today I was dealing with a person who was driving people crazy with hateful words and I started with “Mumbly, Jumbly, North to South, Only kind words can leave your mouth.” I normally don’t interfere in people’s behavior this way. I allow the universe to play things out most of the time, but this person was threatening the happiness of a loved one, and a protection spell alone wouldn’t have been appropriate in this case. Besides, I stipulated that no harm should come to anyone. I always put that in as a safety net. Eight words the wiccan rede fulfill: An’ it harm none. Do what ye will. Those rhyming words help us to remember that harming others is not part of the path that most of us have chosen to follow. Chanting a prayer in rhyme to the Lord and Lady each morning and evening brings comfort to me as I send protection and healing energy to my loved ones. The Word is, indeed, powerful to do harm or to do good along this path on Earth.